During this past summer as the 40th anniversary of the atomic bombing of Hiroshima approached, Reuben Kadish embarked on a new series of terra cotta heads. Shrouded in black plastic, the still unfired assembly resembled a terrifying rogue’s gallery, whose ferocious grimaces exuded a sense of catastrophe that can’t easily be written about. 150,000 dead. The numbers sound small to this society that accepts the possible annihilation of millions, but all soon become statistics reeled off in headlines that deny the humanity beneath the numbers. Kadish fights against this anonymity and its machine-like distancing from the individual: “Not so much Hiroshima as a place but as an idea.” Playing his own version of this black humored numbers game, Kadish estimated that in the next forty years he could make 2,000 heads. “That would give me something to live for,” jested the 73 year old sculptor as he stood in his Vernon, New Jersey studio. The eyes of one elongated head seemed to jump out of their sockets. The scraped features in the still wet clay ran in angry lines of vertical and horizontal tension. The tool the artist used to sculpt the features is a dusty, terra cotta hued pig’s rib, more menacing than a palette knife. The curved and sharp-ended rib glides and gouges at will, fomenting a surface ploughed with furrows and hillocks. The rib itself is a metaphor, for the city-bred Kadish has been a farmer. You have to dodge a field of cow pies to get to his studio, a converted and expanded quonset but that was originally used as a grain dryer. The fertile acreage that surrounds his house and studio, the band of Canadian geese drinking contentedly at a nearby pond, speak of the earth and sky, in sharp contrast to the grotesque congregation lurking inside his studio. The terra cotta he uses is the oldest of art materials, the bond between antiquity and his contemporary world. In this knobby headed cast of characters, with their mottled cheeks, chewed lips and swollen eyes, Kadish’s expressionist vocabulary erupts. The terra cotta is fragile. Heads may fall off their temporary pedestals as they dry, change color and harden as they please, prey to the heat and humidity but most of all to the pressure of the artist’s powerful fingers. They might also explode in the gas fired kiln due to small pockets of air or impurities in the clay. They are fragile yet contain the potential to last through millenias. The sand packed floor, the skylights cut through corrugated metal, the cautionary reminder to shut the studio doors so the cows won’t get in, add up to an atmosphere bounded by daylight and hand pumped water. The heads bear an eerie resemblance to the terra cotta effigies excavated at the ancient site of Sao in Chad (recently exhibited in New York at the Center for African Art). But the cool and colossal marble head of the Roman emperor Constantine (at the Metropolitan) exerts an equal influence over Kadish. The incendiary mixture of emotion and intelligence fires Kadish’s vision just as the strong features and piercing gaze of the proud Roman speak loudly of the power of Imperial Rome. But Kadish’s men have lost their hubris. Their empire is melted, a smouldering graveyard. Aware of their ancestors, these contemporary heads look out, startled, atom-shocked and world weary. Kadish has always immersed himself in the most sensitive of social and political issues. From his student days in Los Angeles, acting as a “gopher” and chauffeur to the Mexican muralist, David Alfaro Siqueiros, Kadish has em-braced the silenced voices of the poor and dispossessed. Part of Siqueiros’ painting team (“equipo”), Kadish worked on the still existent 1932 outdoor mural at the Plaza Art Center in Los Angeles. The mural depicted a crucified peon with a group of Mexicans standing underneath, shooting at the U.S. eagle perched on top of the cross. Public furor whitewashed the mural and prompted Siqueiros’ exit from the U.S. Two years later—on Sequeiros’ urging—Kadish, 21 and Philip Goldstein (before he changed his name to Guston), 22, headed for Morelia in Mexico to paint a 1024 square foot mural at the University of Michoacan in what was once Emperor Maximilian’s summer palace. When Siqueiros departed for Spain at the start of the Spanish Civil War, the two young Americans were left to their own devices. Their intricate theme heralded the workers’ struggle for liberty and depicted grotesquely hooded figures representing the Ku Klux Klan and their forebears from the Spanish Inquisition. Flush with success (a rave two page spread in Time bantered in typical Time-ese style, “Spectacled Muralist Kadish and Dapper Muralist Goldstein are both parlour pinks…” Time quoted their “Patron-Discoverer” Siqueiros, “it is my honest belief that Goldstein and Kadish are the most promising painters in either the U.S. or Mexico.”), Kadish returned to California and painted more murals in collaboration with Guston. Their reception back home however was lukewarm and Guston—encouraged by Jackson Pol-lock’s older brother, Sandy—headed east to try his luck in New York. Kadish stayed with the WPA Federal Art Project, eventually heading the mural division in San Francisco. In an Artforum article (“Emblems of Sorrow: The WPA Art Project in San Francisco”) Kadish is quoted: “I suppose I should feel consoled that in my career as a WPA artist I did 26 designs of which only one was approved and executed” (“A Dissertation on Alchemy” at the San Franciso State College Science Hall, Dec. 1936-Aug. 1937). “And for what it is, I feel proud to have done it.” A letter to Kadish from a Washington official blasted one of his rejected designs, saying it was the kind of art Americans shouldn’t see. A few years later, working as a civilian for the Army Corp of Engineers and living with his wife Barbara (an archaeologist) and their two young sons, Kadish was recruited by Henry Varnum Poor to join the Army Artist Unit, an elite branch, funded by Congress (and later by Life Magazine & Colliers) to document World War II. George Biddle, Edward Laning, Jack Levine, Reginald Marsh and Fletcher Martin were some of the men who covered the far flung theatres of war. Kadish produced a searing series of temperas and ink drawings on famine in India, the starving children of Calcutta, the Japanese bombing of civilian targets and other jarring images of the war. The twisted and charred limbs of bombed trees along with the fantastic sculpted facades of 11th century Indian temples scorched the mind of Kadish. These images would reappear in abstracted forms when he made his first sculptures in the early 1950s. So Kadish moved with his family to New York and settled in Long Island City. Many artists made similar journeys east after the war. Abstract Expressionism and the New York School were waiting in the wings. But as fate would have it (and Kadish is a strong believer in the oracles of ancient Greece), the family was soon evicted and despite the plenitude of cheap lofts in places like Spanish Harlem (the bullet holes on the door did not appeal to Barbara, pregnant with their third son), the family moved to a New Jersey farm that had been a black market slaughtering house. Kadish the muralist and documentor became a dairy farmer. “I got involved with animals,” he said, “and was no longer able to give time to painting.” So the artist pretty much disappeared from the New York scene from the middle of the 1940’s to the middle of the next decade. He continuously drew however and as he relates it, “I woke up one merry day and realized many of my drawings were meant for sculpture and decided to turn them into three dimensions.” The painter-turned-farmer transmogrified again and became a sculptor. His exquisite draughtsmanship crystalized the metamorphosis. Kadish began a long association with the Modern Art Foundry in Long Island City, ironically located two blocks away from the apartment he was evicted from. Kadish fine-tuned his lost wax casting technique with the help of sculptor Fred Farr’s unique expertise. “Most of my pieces,” observes the artist, “are not fluid. There’s a lot of noise going on beneath the surface.” Kadish taught drawing and sculpture along with James Rosati, Reuben Nakian and the painter, Ben Cunningham at the Newark School of Fine Arts and began to show his work in the cooperative galleries that dotted East 10th Street. By 1959 he was firmly planted in the mostly Abstract Expressionist downtown terrain. Writing in Portfolio, the hard cover Art News Annual, in the fall of 1959, Thomas B. Hess picked Kadish as one of the “lesser known of American sculptural talents…Kadish seizes the throat of the contemporary reality without style, without pretense, This is It.” Hess’ epic article, “U.S. Sculpture: Some Recent Directions” was the first in a flurry of recognition concerning Kadish’s terra cotta and bronze sculpture. That same year he exhibited in the V Sao Paulo Biennale in the august company of Phil Guston, David Smith, Robert Rauschenburg and others. He was invited to participate in the New Sculpture Group annual exhibitions held at the Stable Gallery and elsewhere. Picked by his peers, Kadish’s long sabbatical from the art world ended. 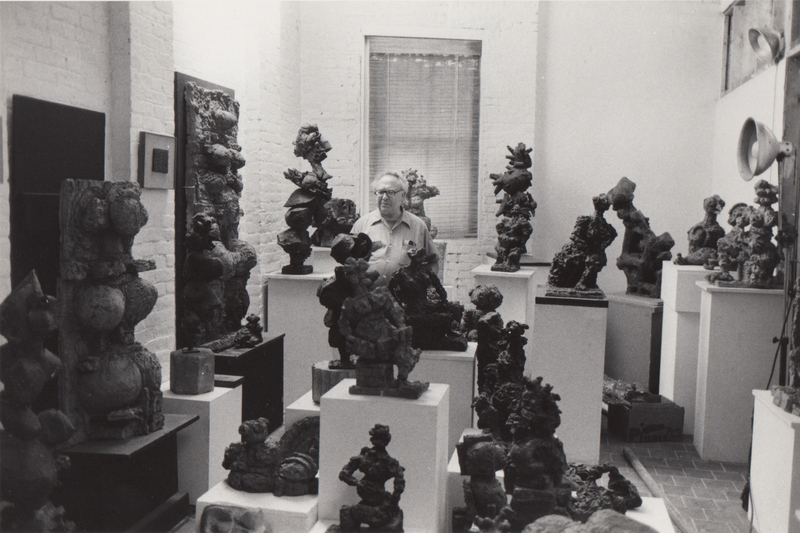 On the occasion of his first one man sculpture show at the Poindexter Gallery in January, 1961 (yes, just 25 years ago), Lawrence Campbell wrote in Art News: “It is as though these were ancient, archaic works that Kadish had grabbed by their throats, shook like dogs and forced to be modern.” Kadish’s “Queen of Darkness” was reproduced in the magazine and makes a reappearance with this exhibition. To some tastemakers Kadish’s singular expressionism doesn’t look right and seems to come from another time. But as the painter Herman Cherry (a long-time friend of the artist) explains it, “Like Rodin, he’s always out of whack with the times.” Kadish harbors a passion for cultural anthropology, the bulging figure of the Venus of Willendorf (circa 15,000-10,000 BC) and her ivory sister, the “Venus” of Lespugue. He uses archaic Greek and Egyptian myths and tempers them with Hebraic wisdom, from the “Wandering Oedipus” to the grieving “Demeter,” goddess of nature, a pantheon most mortals have lost touch with. The fantastic stories, incredible passions and tragedies that cling to their names, fit seamlessly into Kadish’s world. Earth goddess Isis is a crucial image to the artist. The attributes of Demeter, goddess of the crops and devoted mother meet the farmer and family man Kadish head on. Just as in the female statuettes of clay from the 6th millenium BC, Kadish exaggerates the female form, endowing her with mountainous breasts and a hilly mons veneris to celebrate her fecundity and life affirming power. The combination today of the “farmer-sculptor” (David Smith fits this category) takes on a mythic tint. Of course this profile is exaggerated. Kadish shuttles between his farm in New Jersey and his longtime city home on East 9th Street, around the corner from Cooper Union where he has taught sculpture for 25 years. He is up to the minute in politics and culture. It is as though his skin were a sieve, soaking in past and present cultures, from the East and West, jumping centuries, taking only the best, rejecting the mediocre and momentarily fashionable. It is no coincidence that his favorite materials—terra cotta and bronze—have lasted through the ages. His hand is ever present. There is never an untouched surface. Kadish unleashes raw emotion tethered to a quicksilver intelligence. The results are never pretty because his imagery is too powerful and hieroglyphic for mere pretense. It is just in that way—without shortcuts—that the new work reverberates with his past achievements.